A beautifully illustrated collection of favorite rhymes for little ones preparing for bedtime. Rosalind Beardshaw’s artwork features wonderful natural scenes, with adorable sleepy animals and babies ready to be lulled to sleep. 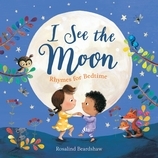 Includes: "I See the Moon," "Twinkle, Twinkle, Little Star," "Hush-a-Bye, Baby," "Golden Slumbers," "Bed in Summer," "Star Light, Star Bright," "Girls and Boys Come Out to Play," "Hush, Little Baby," and "Good Night, Sleep Tight"
A beautifully illustrated collection of favorite rhymes for little ones preparing for bedtime. 24 / 10 5/8" x 10 5/8"
Rosalind Beardshaw is the illustrator of many books for children, including Warthog, Box, Just Right for Christmas, and the Walk and See board book series. She loves creating new characters, especially if they can be based on her dog, Basil. She lives with her partner and her children in York, England.